This oddball dwarcraft (or maybe dwarf 'em up?) 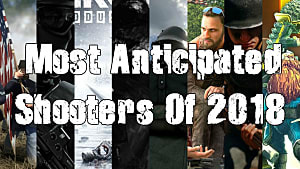 title was one of our most anticipated FPS games of the year off of the strength of its intriguing concept and eye-catching art style. Of course, four-player team shooters certainly aren't anything new -- from Left 4 Dead to a whole lot of WWII games and Space Hulk: Deathwing, we've tread this ground before. 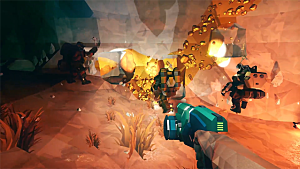 What's different with Deep Rock Galactic is the focus on taming the environment, navigating by tunneling or climbing, and its underground interesting setting -- where one wrong step sends you plummeting to your doom. The darkened corridors of a bug-infested planet make for a crazy multiplayer ride as you and your equally greedy dwarf co-workers try to make as much money as possible for your intergalactic mining corporation. 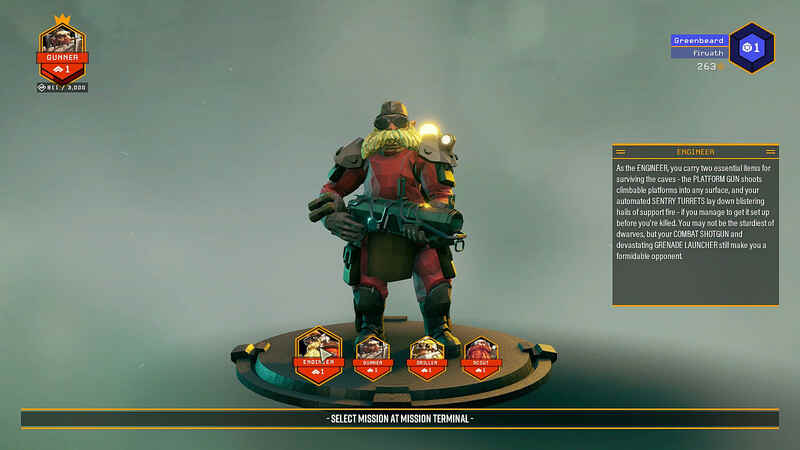 After the tutorial mission and jumping into a quick match (or looking for specific matches that are at your skill level), Deep Rock Galactic features four different -- and quite satisfying -- classes to pick. 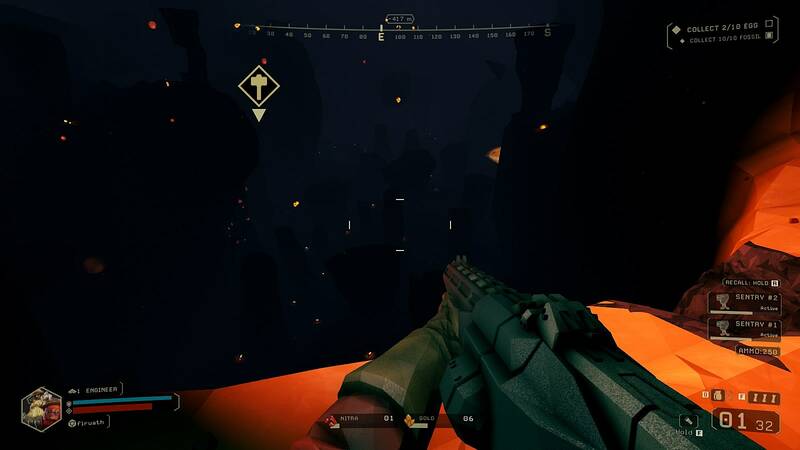 Each strongly showcases a different focus on how to achieve goals in an underground tunnel complex, and there's a lot more variation than in the typical shotgunner/ sniper/ assault rifle loadout you'd expect from an FPS. Make no mistake, DRG is very much a team-focused outing. You want a well-rounded group of miners to be able to get around effectively. Without the zip lines, platforms, and quick tunneling options you will find it hard to reach high or low locations -- or to get to your team mates who may have been overrun by skittering awful monsters after falling into a chasm. While there are periodic swarms of enemies to fight while mining, the real enemy here is the terrain and the lack of light. In fact, that interplay between light and darkness is one of the game's strongest points. The experience can get very tense, either via claustrophobia from tight tunnels or agoraphobia from overly open spaces where you can easily fall to your death if you aren't paying attention. 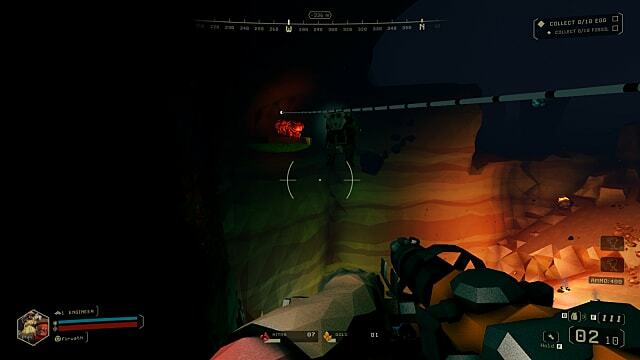 Learning how to tunnel with your pick or use the special ability of your class to reach new areas is crucial, as there are wide open cave structures to fall into without any light to highlight your footing. When you finally complete a map's objectives, there's limited time to reach the escape pod at the end of missions, which forces you to work in tandem with your team mates to get up to higher areas or tunnel through tight spaces. In one match I played during early access, figuring out how to reach the mining objectives was a fun puzzle to work out between players. In the next, it was an intensely frustrating case study in how procedurally generated maps can go very, very wrong. We found two out of 10 alien egg objectives quickly, but then couldn't find any others. There was no obvious way out of this wide circular chamber and we just ended up running in circles, tunneling random directions with nowhere to go. After about 45 minutes of a match that was supposed to be on a 1-Star "short length" mission, we finally admitted defeat and all just logged off in frustration. Similarly frustrating experiences pop up for newbies in several different major game mechanics. A voiceover tells you to mine Nitra veins for ammo, but it doesn't seem to work. I mined plenty of the ore but remained at zero ammo after surviving several waves of enemies. I tried depositing my stash in the MULE but still remained at zero ammo. After pressing every possible button, I couldn't find any sort of crafting menu to turn it into ammo. After losing that round because none of us had any way to effectively fight without ammo, I had to hit the forums to discover the secret. Apparently, all the teammates have to deposit Nitra until hitting a certain threshold, then there's a separate keyboard option to call down an ammo resupply. Annoyingly, there was no indication of any of this through in-game prompts or in the controls menu. 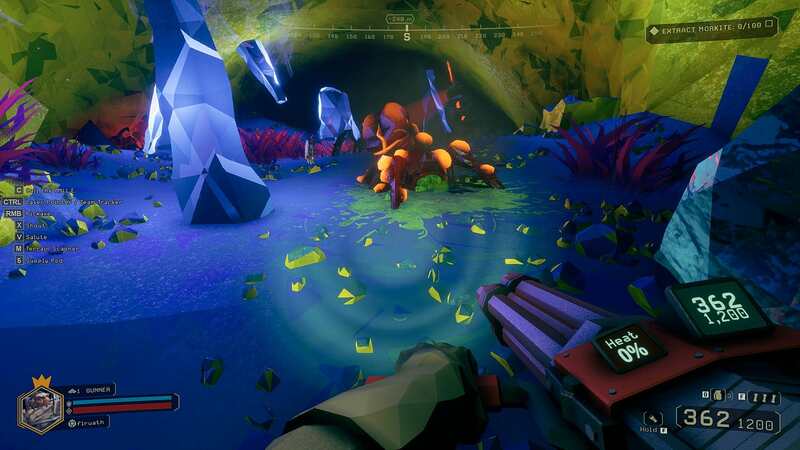 Variety is one of the bigger issues for Deep Rock Galactic right now. 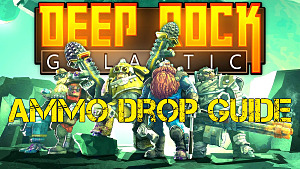 More level types are a must, and Deep Rock Galactic will absolutely need a lot more enemy types and expansions on the progression system before full release. Fortnite felt overly complex at first, but now that I'm used to all those different ways to pick new skills and upgrade characters in a multiplayer focused game, this feels overly simple by comparison. Some of the physics are also quite odd and need of tweaking, which is bad for a game based around the concept of mining. If you dig out the middle of a column for instance, the top of the column stays floating in the air. Whoops. Sadly, there's no split screen for console players either, although that just seems to be the way things have been going in the industry lately. 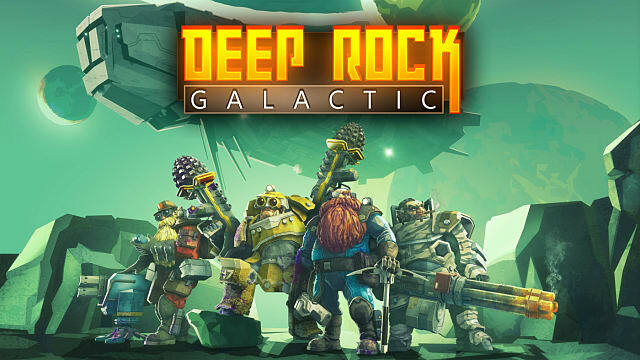 Deep Rock has plenty of positive aspects going for it, though. The game is surprisingly stable for an indie early access title, and I never experienced a single crash. 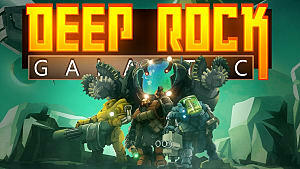 I'm also loving that these graphically pleasing co-op style games have been landing a lot lately, like Fortnite, Sea Of Thieves, and now Deep Rock Galactic. They don't need to be hyper-realistic, but instead offer something more interesting to look at over extended periods of time. The game's unique style with gruff, grumbling, greedy dwarves working in tandem has something very special brewing... if the developers can overcome some glaring issues in early access.